Indigo Pearl guests can look forward to the New York Thymes – although perhaps not with their morning newspaper – and a host of other creative cocktails following the appointment of new mixology guru Dhasan ‘Golffy’ Prabhanandan. “Ketel One Vodka, Vanilla Bean, Cranberry Juice, Aromatic Lemon Thyme and Citrus Air,” were the ingredients required to create the New York Thymes, Golffy explained. This exotic tipple is one of a selection of signature Golffy blends featuring rare liqueurs, artisanal decoctions and assorted obscure ingredients now available in the resort’s renowned nocturnal hotspots, Dirty Monstera and Rebar. Since joining Indigo Pearl last month, the Los Angeles born and raised mix-meister has elevated the sophistication and creativity of the drinks menu, adding the benefits of his experience not only as one of Asia’s most acclaimed and in-demand mixologists but also as a Bachelor of Psychology with a degree from University of California Los Angeles (UCLA) and former bartender at Los Angeles dining institutions including The Beverly Hilton, The Standard, Koi and Geisha House. Golffy says it was while working as a bartender in LA that he began to develop an interest, and then a passion, for mixology. A short vacation to explore his roots in Thailand in 2007 ignited a simmering passion for Thailand and an urge to explore Asia. Shortly thereafter, Golffy packed his bags and moved to Bangkok, establishing himself as a mixologist and culinary consultant of considerable talent. 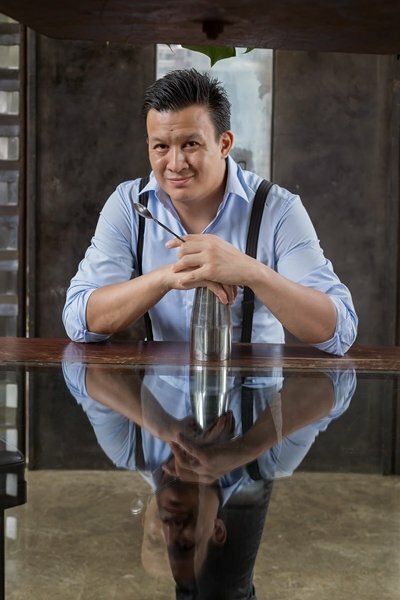 He has worked with clients including Diageo Moet Hennessy Thailand, Italasia Group Bangkok & Koh Samui Thailand, Ambrose Wine Thailand, Bacardi Ltd Thailand, Stoli Vodka Singapore, Mercedes-Benz, Vogue Fashion Week, Siam Paragon, The Library in Koh Samui, Little Beast Gastropub, Mellow Bar and BADMOTEL in Thong Lor, Ketel One Vodka, Johnny Walker Blacklist & Gold Label, Clouds Bar & Restaurant, Four Seasons Bangkok, Grand Hyatt Erawan Bangkok, Zen Department Store, Siam Kempinski Hotel, SkyBar at Traders Hotel in Kuala Lumpur, and with acclaimed mixologist Joseph Boroski’s Sip Slowly Mixsultancy in Bangkok. Other standouts from Golffy’s signature Indigo Pearl signature creations menu include Charlotte Anthos (Tanqueray Gin, Homemade Snow Pear & Rosemary Puree, Elderflower Cordial, Granny Smith Apples and Sauvignon Blanc Espuma), Kyoto Plum Sour (JunMai Daiginjo Sake, Peach Schnapps, Yuzu, Sweet Plum and Egg White), Dirty Girl Pop (Appleton Estate Reserve Jamaican Rum, Shiraz, Oro Blanco Grapefruit, Indiginous Strawberry Angostura Bitters, Strawberry Shiraz Popsicle) and Manfredi’s Happy Ending (Baileys Irish Cream, Kahlua Coffee Liquor, Hazelnut, Double Espresso and Macaroon). Try to understand: The New York Thymes effect on man … and indeed upon all guests who surrender to its sophisticated kick, as a Golffy-created Indigo Pearl signature tipple. For high resolution version, click here.Hail Bloody Mary: The deliciously potent and flavourful Call Me a Cab is another Golffy standout from Indigo Pearl’s new mixologist. Golffy can mostly be found behind the bar at Dirty Monstera, a sophisticated temple to mixology with curvaceous leather booths and clubby upholstered chairs. Golffy’s signature cocktails complement the resort’s full range of classic drinks and grace a light gourmet menu of tapas and mezze for grazing. Golffy can also be seen strolling around the resort with what might be mistaken for a shoeshine box or a picnic hamper. In fact, he’s turned himself into a one-man walking wet bar. Indigo Pearl General Manager Chris Oakes said he was delighted to have Golffy on board. “I’ve been most impressed by his creativity and flair, but also his dedication to his craft and his ability to connect and engage with guests,” Mr Oakes said.